Boys now seek refuge in cheesy horror novels because the Cultural Authorities won’t give them the adventure books that were once staples in every boy’s life. It is to this I attribute the popularity of vampire novels (and movies and television shows). But even here a boy is destined for disappointment. In fact, the extent of our modern cultural crisis can be at least partly measured by the plight of the vampire. The vampire of yore was an evil and only partly human creature. He sucked people’s blood and didn’t second guess himself. The modern vampire is the pure creation of the modern therapeutic mindset: a tortured emotional soul dealing with his vampire condition as if it were some kind of psychological neurosis. The vampire of old was a danger to others; the modern vampire is a danger primarily to himself. The vampire of old looked into the mirror and saw nothing; the modern vampire looks into a mirror and sees the other part of his bi-polar self. Dealing with the vampire of old required only a stake through the heart; dealing with the modern vampire involves months on the psychologist’s couch. The pure evil of the traditional vampire is a rebuke to the modern relativism that dominates our literature, which avoids unadulterated evil because it implies an equally unadulterated—and unacceptable—good. 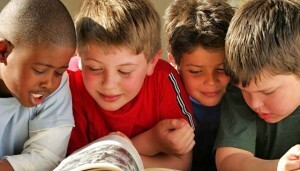 Morality has been replaced in young adult literature by therapy, and boys have fled in droves. Heroism can never be completely eliminated from literature because we are naturally attracted to it. And so, when it is repressed (if you will forgive my commission of psychologism in the very act of criticizing it), it always comes back in some other form. This accounts for the continuing popularity of comic books and the more recent phenomenon of superhero movies. Our culture has never fully recovered from the demise of the classic Western. We have to have heroes, and in an age in which we were not ashamed of it, we put them in a historical context. These were things that really could—and sometimes did—happen. But in the modern era, we are not supposed to admire great men, largely because we are uncomfortable with the whole idea of greatness. So today we must relegate our heroes to the realm of the fantastic. They are now figures who could never really be, doing things that can never really be done. And even here, the therapeutic is never far off. Every modern superhero must deal with the psychological consequences of something from his childhood: for Spiderman it is the murder of his uncle; for Batman the murder of his parents; and, of course, Superman’s planet has been blown up. The modern superhero wreaks havoc on the bad guys less because he is pursuing truth, justice, and the American way than because it is the only way he can work out his angst. This is less so with Superman and more so with Batman. The mother of a friend of mine in high school was a famous psychologist. One day I noticed padded bats propped up against the wall and asked, “What are those?” She told me they were for her mom’s patients so they could express their anger without hurting anybody. Common people get to work out their anxiety with padded bats—and we don’t even get to destroy anything. Batman, on the other hand, gets a helicopter, a fast car, and a cool costume—and destroys half a city. I have three boys, mostly grown now. Not a one of them ever needed to be led into “deeper engagement” with his life. Had you asked my wife about it at the time, she would have told you that they were all way too engaged in their own lives and that they needed to think about something else—like cleaning their rooms or mowing the lawn. And I hate to think of what would have happened if anyone had tried to “prick their dormant empathy.” To any healthy boy, those are fighting words. Boys, though they cannot articulate it, can usually see right through the modern psychobabble. In fact, say what you will about the Harry Potter books (and plenty has been said), they at least betray a consciousness of the old adventure ideal, and are light on the psychological reflexiveness—at least in the early books in the series, although I am told (I have not read them) that the later books portray a more effeminate Harry. We have the mistaken impression that it was traditional children’s literature that was preachy. This is not only untrue, but it is almost the exact opposite of the truth. It is precisely the preachiness of politically correct modern literature that offends their innate sense of honesty and justice—a human instinct that we do our best to educate out of them. Boys are not interested in getting in touch with themselves, and it is particularly off-putting when they are told that it is good for them. The minute the politically correct schoolmarms approach, they head for the woods, where they are free to pick up sticks and pretend they are swords and fight monsters and hunt frogs and swing from trees—anything but to be preached at by people whose sermons consist of high-minded meaninglessness. The older authors of books for boys knew this: they forsook the sermonizing for the story of men in action. G. A. Henty, Johnston McCulley, Anthony Hope, H. Rider Haggard, P. C. Wren, Howard Pyle, C. S. Forester, as well as Western authors like Louis L’Amour and Max Brand—these were authors boys not only didn’t avoid, but sought out. Even a few female authors were on to this secret about boys: Baronness Orczy, she of Scarlet Pimpernel fame, being the most notable, as well as Laura Ingalls Wilder. Their books were once illumined by flashlights under bed covers so that, late at night, when they were supposed to be asleep, the young male reader could find out what happened next. To do the same with most modern therapeutic fiction would be a waste of batteries. This is not a romantic discourse on the nature of the boy and how we should leave him to develop on his own, but merely a defense of the idea that he has a nature, and that it should be taken into account in how we deal with him. A necessary part of this (given that this nature doesn’t always lend itself to doing what the dictates of civilization require) is a straightforward and honest discipline, something which too often these days has been replaced by psychotropic drugs. Boys need to be tamed, not treated. This article and many like it are originally published at The Memoria Press Online Academy. Mr. Cothran, a writer and teacher who lives in Danville, Kentucky with his wife and four children, is the director of the Online Classical Academy. He is the editor of Memoria Press's "Classical Teacher" magazine, and is the author of Memoria Press's Traditional Logic, Material Logic, and Classical Rhetoric programs, as well as Lingua Biblica: Old Testament Stories in Latin. He is the Latin, Logic, and Rhetoric Instructor at Highlands Latin School in Louisville, Kentucky. He holds a B.A. in Philosophy and Economics from the University of California at Santa Barbara and an M.A. in Christian Apologetics from the Simon Greenleaf. For the past 15 years, he has been an influential voice on public policy issues at the Kentucky State Capitol. He has been heard on ABC Radio News, American Family Radio, and Family News in Focus.